» Quiz - Shore and Wading Birds! 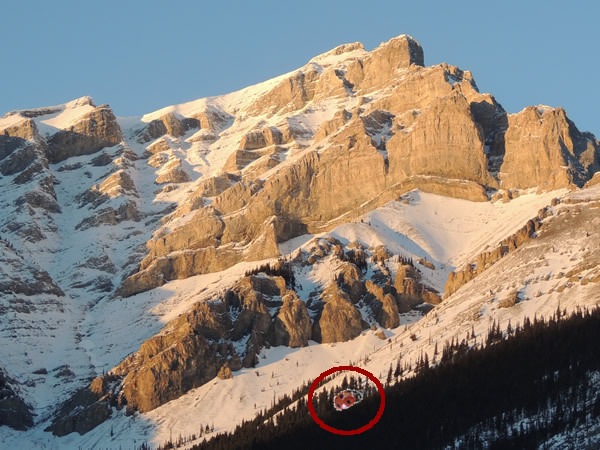 PLUS - great photographs from contributors | mystery image | a laugh or two and more! 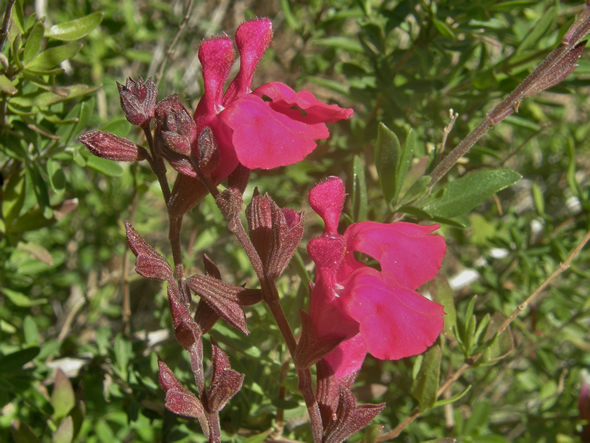 As the summer starts to wrap up and we slide towards autumn, you are welcomed this month by Autumn Sage, Salvia greggii. 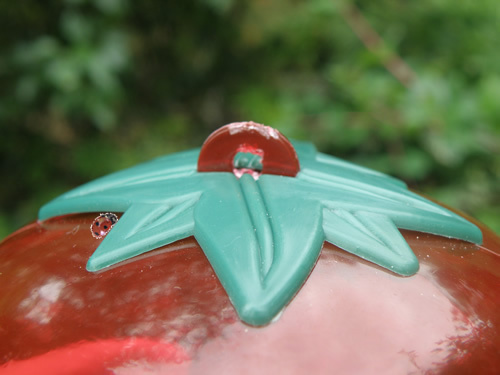 While you're reading this month, be sure to keep an eye out for Lily the Ladybug. She's managed to hide in one of the photos, but which one?! Mormon pioneers ate the bulbs of which lilies? Compare your answer with the answer at the end of the newsletter. 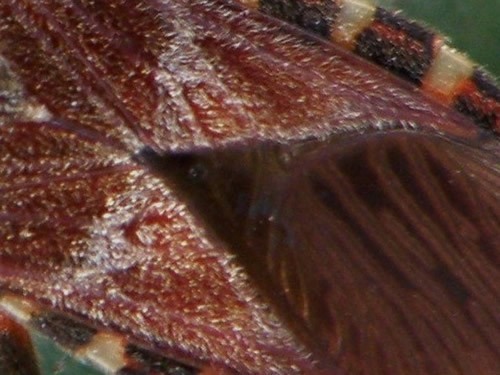 Here's a close-up image to test your mystery-solving skills. As usual, you'll find the answer at the end of the newsletter. 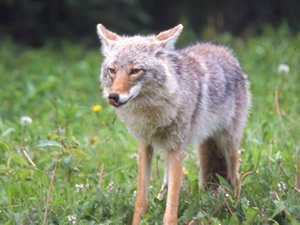 _ Coyotes are resourceful members of the family Canidae and are closely related to dogs and wolves. They have thick, bushy tails, pointed ears and long, pointy noses. Coyotes generally hunt alone, feeding on small rodents, birds and rabbits which don't provide much food for a more than one. 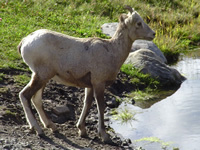 In the winter, if food is scarce they hunt in a pack for larger game. Coyotes were originally animals of the plains but nowadays their range has spread to cover almost all of North America, except the far north. 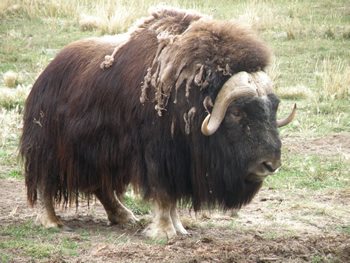 They have adapted to live in woodlands, forests, sea coasts, mountains and even parts of cities. Coyotes can run quite fast - up to 40 mph/67 kph but only for short distances. They are able to chase prey over long distances. When running coyotes tend to keep their tails down whereas wolves keep their tails high. Coyotes are about the size of a small German Shepherd. This month's quiz features shore and wading birds and is a little tricky! 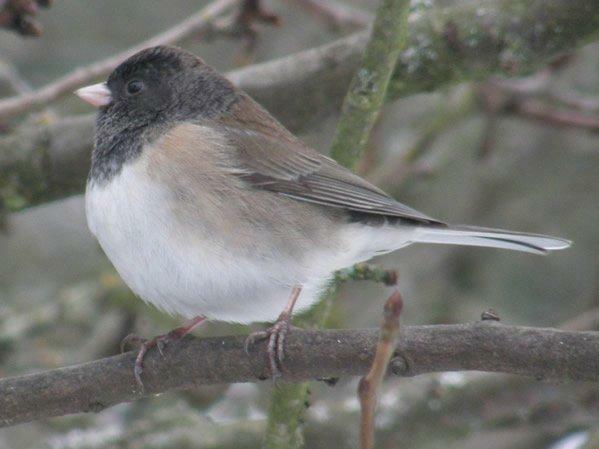 Can you match the photos of the following birds with the correct name? Make a list 1 through 8 and start matching! Good luck. Quiz answers are found later in this issue of Whispers. a few fascinating nature words into your daily conversations! Derrick was very surprised when his son told him that he wanted to go to university to become a lepidopterist. What does his son want to study? a. Leopards and big cats. You'll find the answer at the end of this month's Whispers. 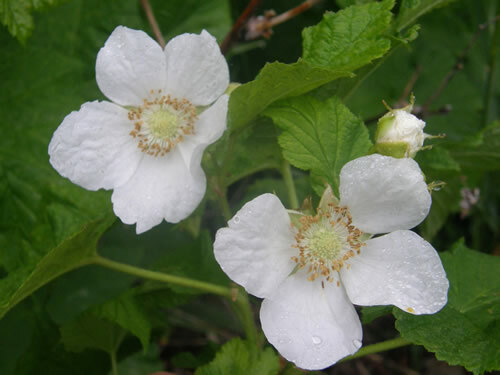 Our featured page this month is called A Look at Shrubs where you can learn about some of the flowers and fruits of these woody plants such as this Thimbleberry, Rubus parviflorus. 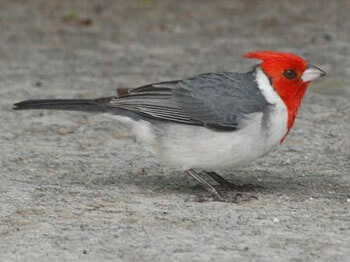 Steve Slayton of Lawrenceville in Georgia sent us this picture of a Red crested Cardinal. 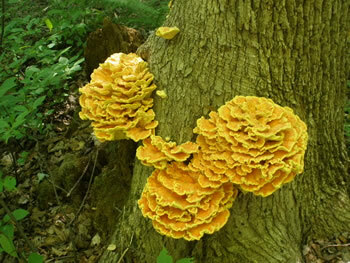 This fascinating fungi called Chicken of the Woods, was sent to us by Albertina Pianarosa in Ottawa. 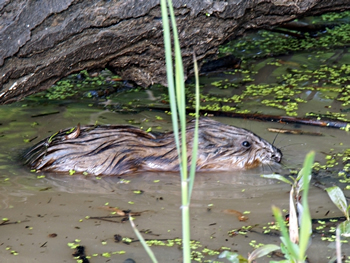 A muskrat in the backwaters of Rend Lake in Southern Illinois was spotted by Jim Noeninger of Shiloh, IL. 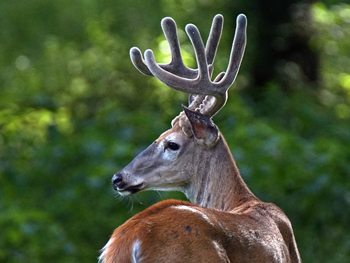 Jim also visited Lone Elk Park near St. Louis and was fortunate enough to spot this White-tailed deer. These two photographs come from Tracy Capps of Mascoutah, IL. 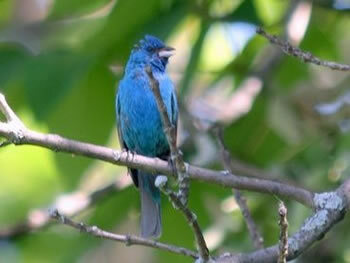 The beautiful bird is a male Indigo Bunting while on the right is a great shot of a Spicebush Swallowtail Butterfly. Thanks so very much to Steve, Albertina, Tracy and Jim for another great set of images. We really appreciate your contributions for us all to enjoy. If you have a nature image you'd like to see in this section, please let us know!. This month we wander into the forest to see what is to be found. 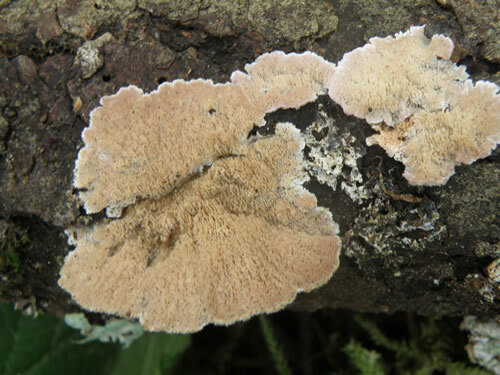 This interesting fungus is Purplepore Bracket Fungus, Trichaptum abietinum. 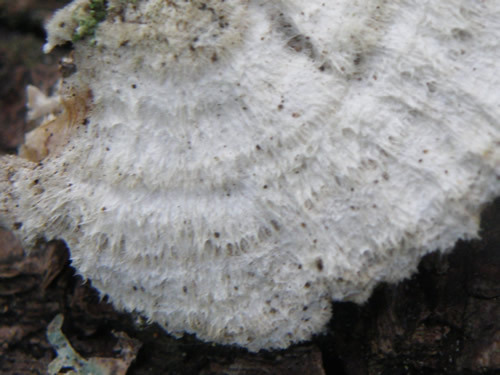 The genus part of the scientific name, Trichaptum, means "clinging with hairs." The species name, abietinum, means "inhabiting the fir tree," a reference to the fir trees on which is likes to grow. This is the underside where you can see the tiny hairs. 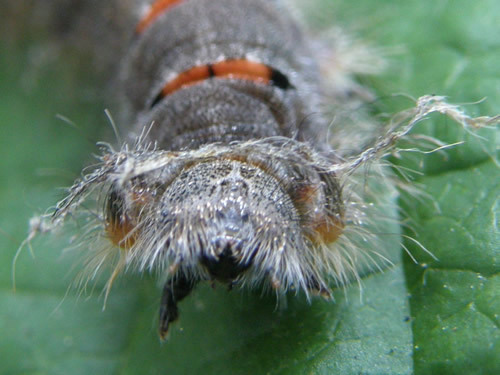 Do you have an idea for a fun caption for this photo of a Lappet Moth caterpillar? #1 - "My mother likes me. She thinks I'm real handsome!" #2 - "Who's a pretty boy then?" This delightful and serene scene comes to us from Tracy Capps of Mascoutah, IL. 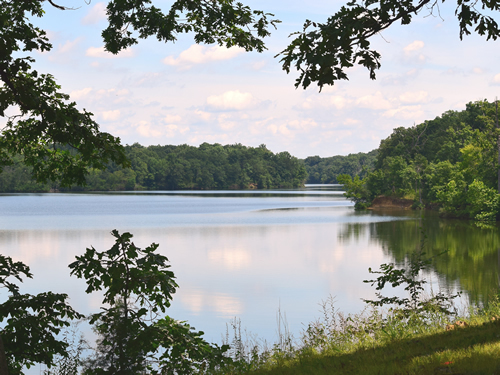 It's a calm lake with lush vegetation in Washington County State Recreation Area near Nashville, IL. Thanks Tracy for sending this in for us all to enjoy. It looks like such a peaceful place to spend the day. ___A bear called the airline customer-service desk and asked if she could take her pet raccoon on board. 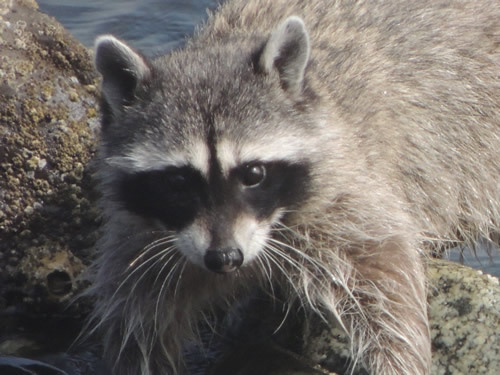 ___"Sure as long as you provide your own kennel and it has to be large enough for the raccoon to stand up, sit down, turn around, and roll over," said the representative. "I think I could have done all of those things!" 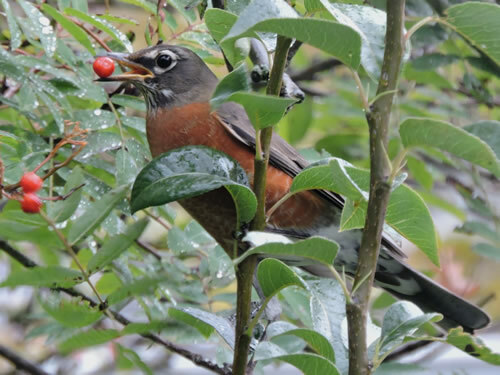 It's time to think about storing some winter berries for the birds. When the birds start to eat them, they are ready for you to put some bags of them in the freezer. When winter sets in you can then help the birds by handing a few out each day. 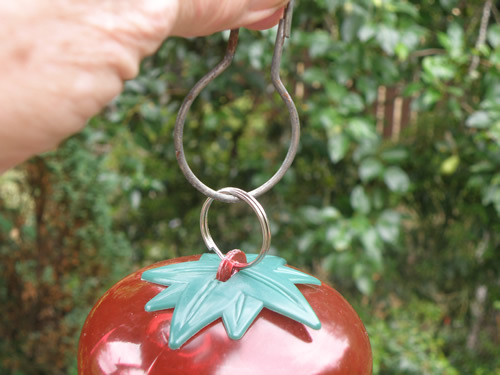 Shower curtain hooks are excellent for hanging up hummingbird feeders. 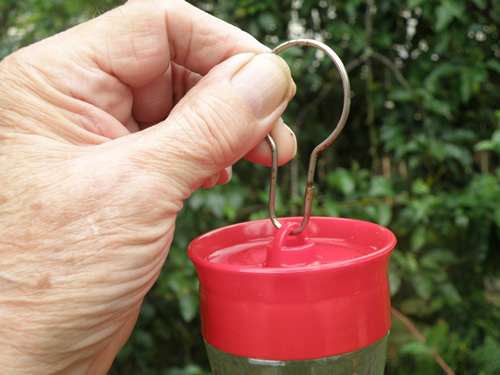 They are much more convenient than the strips of wire that usually come with the feeder. Sometimes however, the hanging hole is not large enough for the curtain hook. The solution for that is to use a split ring through the hole and then attach the shower curtain hook. Juncos will love this gourmet delight! Mix all ingredients together and press into a 11 x 9 inch dish. Bake for 30 to 35 minutes. Reduce the heat a bit if the bread starts to form a hard crust. Once cooled, break the bread into pieces. Pop the pieces into mesh bags and hang up outside. Click here for printer friendly version of this recipe. If you would like us to send you a quick e-mail when the next issue of Whispers is available, simply send us a quick note quick note and we will add you to our distribution list. 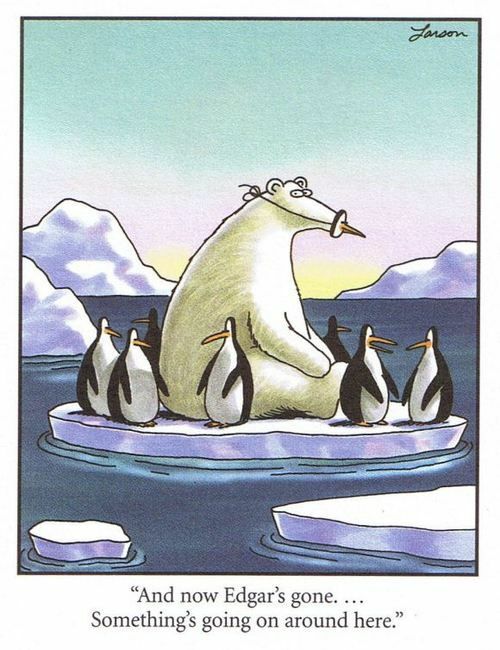 On September 4 it's time to celebrate National Wildlife Day! Click here for more information. 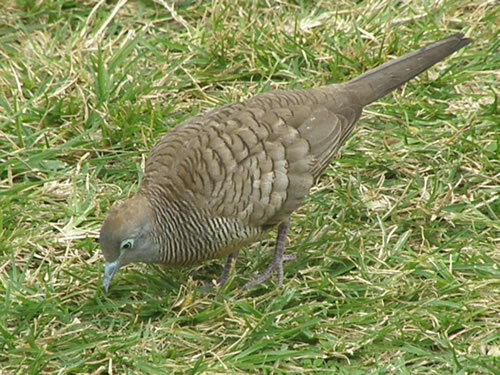 Did you know that Zebra Doves are among the most abundant birds in Hawaii?. Furthermore, because of their calls they are popular as pets in such places as Thailand and Indonesia where cooing competitions are held to find the bird with the best voice! 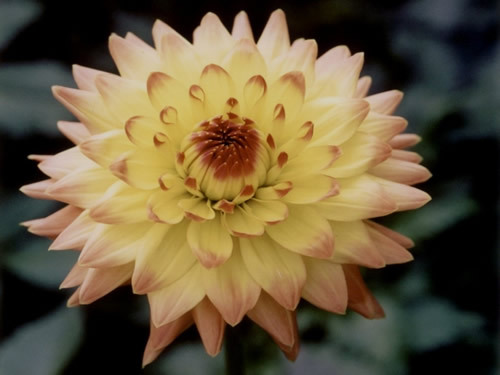 The floral emblem of Mexico is the beautiful Dahlia. Mexico is home to numerous different species of Dahlia. Historically, the Aztecs used the plants for medicine. 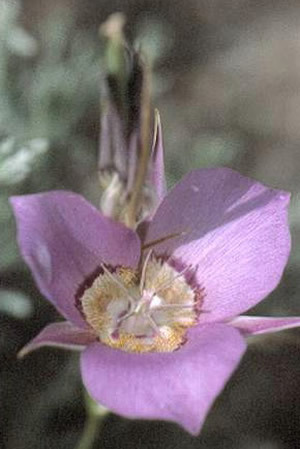 Mormon pioneers used Mariposa Lilies as a source of food. 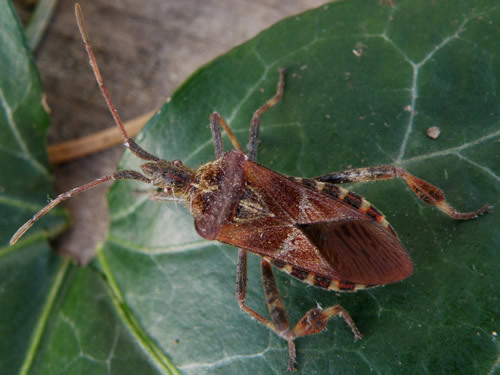 a Western Conifer Seed Bug, Leptoglossus occidentalis. Butterflies and moths belong to an order of insects called Lepidoptera. 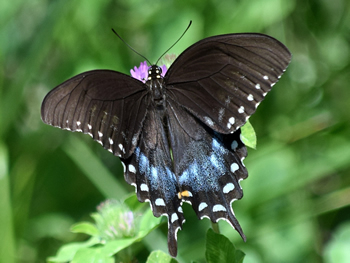 Lepidoptera comes from the Greek word "lepido" which means scales and "ptera" meaning wings as they have what looks like scales on all four of their wings. The scales are actually tiny flat hairs which create the dazzling colours and patterns. And if you're wondering what the two leftover names look like, here they are. If you need a little clue, click here! Did you find Lily last month? Thanks for joining us this month. We hope you enjoyed this issue of Whispers. We invite your comments and ideas - just drop us an e-mail. See you next month!